About "Using dot plots to make inferences"
After obtaining a random sample of a population, you can make inferences about the population. Random samples are usually representative and support valid inferences. Rosee asked students on the lunch line how many books they had in their backpacks. She recorded the data as a list: 2, 6, 1, 0, 4, 1, 4, 2, 2. (i) Make a dot plot for the books carried by this sample of students. Make a real number line. In the given data, we have values range from from 0 to 6. So we have to use a scale from 0 to 6. Place a dot above each number on the number line for each time it appears in the data set. (ii) How are the number of dots you plotted related to the number of data values ? They are the same. Each dot represents one data value. (iii) What could Rosee do to improve the quality of her data ? Rosee could increase the size of her sample. A baseball team manager records the number of runs scored by the team in each game for several weeks. (i) Make a dot plot to know how the data is distributed. In the given data, we have values range from from 0 to 11. So we have to use a scale from 0 to 11. (ii) How many games did the team play during the season? How can you tell from looking at the dot plot? There are 19 dots in total above the numbers where each dot represents a game. So, the team played 19 games during the season. (iii) At how many games did the team score 2 runs or fewer? How do you know? 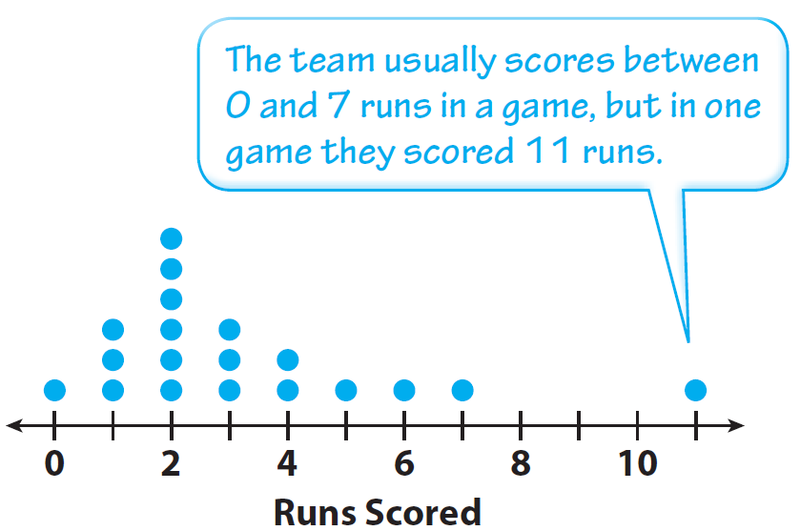 In 10 games the team scored 2 runs or fewer; I counted the number of dots for the values less than or equal to 2. (ii) Tell how many games the team played, and identify the data value with the greatest frequency. There are 14 dots in total above the numbers where each dot represents a game. So the team played 14 games. And the value with the greatest frequency is 4. So there were 4 games in which the team scored 4 runs. After having gone through the stuff given above, we hope that the students would have understood "Using dot plots to make inferences".